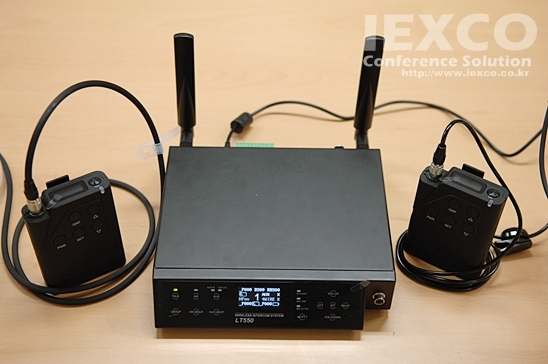 LAON’s Exclusive non-compressed audio transmission system supports high quality wireless communication. ● AES256 encryption technology avoids unauthorized wiretapping or interrupting your communication. ● Wide bandwidth of UNII band 5GHz license-free operation gives you outstanding and clear sound. UNII band 5GHz is interference-free and license-free. Just enjoy the free communication. ● Triple Diversity – space, time, and frequency offers the most dependable system by duplicated communication coverage. The strongest signal is selected from two different antennas, transmitted and received at two different times, on two different frequencies. ● The vertical and horizontal antenna setting is specially designed to prevent dropouts and to choose the strongest audio signal. ● OLED display on BS550 and BP550 offers clear view of all the manuals and displays on the device. ● LT-550 gets you 5 independent talk groups, and each Beltpack can be assigned to single or multiple talk groups.